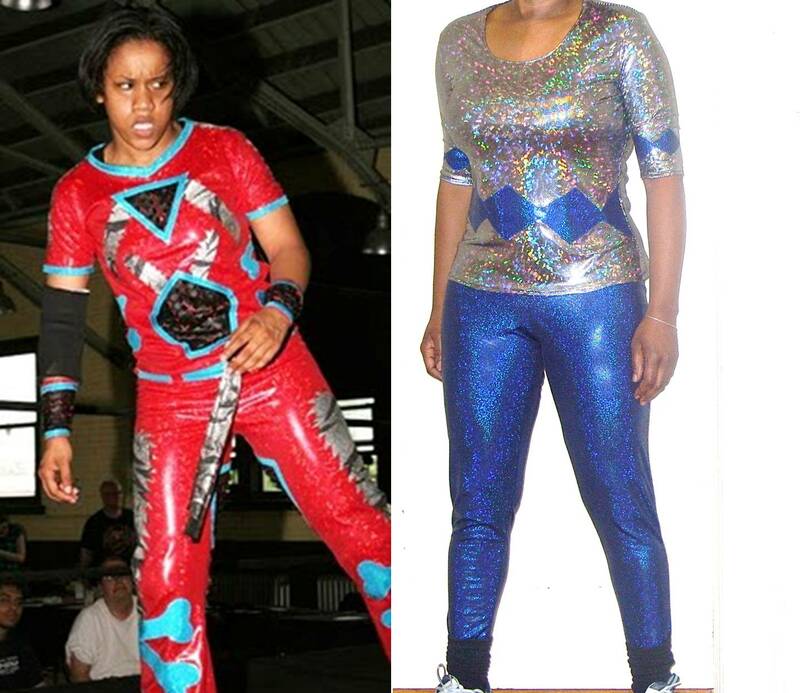 ETA: Just spoke to my niece and she LOVES her wrestling gear... totally LOVE IT!!!! In talking to her further... I learned that her original outfit was $250.00... yikes!!!. I will defintitely make another one for her. my sewing mojo that is.... and with a tight hold, I immediately took advantage and whipped up my niece's wrestling outfit, despite the fact that she's been waiting since August. When she asked me could I make a wrestling outfit for her I was thrown for a loop and stammered a meek yes. 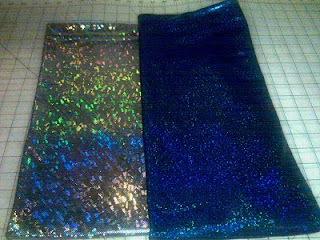 We headed to Joanns and she picked out her fabric of metallic swimwear in silver and electric blue and was unable to find a legging pattern and opted for something similiar in my stash. To get the gist of making the tights, I did a muslin using New Look 6983 and with a lil tweaking was able to get a close fit, but was concerned about the durability of the seams. I posted about this in August and Miriam in KS suggested that I use wooly nylon to ensure that the seams would be secure and after having no success at Joanns was able to get several spools during a fabric excursion from Pacific Trimming. Thanks again Miriam. I'd actually found a legging pattern McCalls 6193 and contemplated using that instead, but quickly decided against it in that I'd already tweaked NL 6983. I used the wooly nylon in my lower & upper loopers of my serger and regular serger thread for the other loopers. All the seams were serged. Wooly Nylon is my new best friend, I love the way it sews and will continue to use it for my knits. I was too lazy to do a casing for the elastic and instead sewed the elastic along the outside of the waistband and flipped to the inside and final stitched, and after sewing the elastic on did I realized I should've used the black elastic...duh! For the top I used McCalls 5854, Version B and I opted out of the neck facing and instead raised the neckline 1-1/2" serged it and folded to the inside and final stitched. 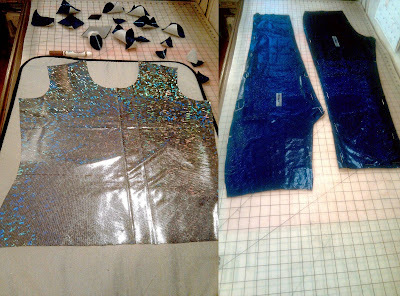 Before sewing the shoulder & side seams, I attached diamond shapes in an attempt to coordinate the top with the pants. I printed out a diamond shape and affixed it to cardstock to use as a template, used heat & bond on the wrong side of the blue fabric remnant and placing the diamond template on the fabric and cut out several. Then peeling off the backing, positioned the shapes and ironed and stitched along each shape. I didn't want to go overboard with the placement of the shapes and kept it simple. 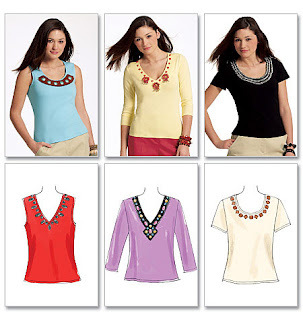 If I were to do it again, I would go with a top with a closer neckline and shorter sleeves. The top is snug on me since I am bustier than my neice. I sent her a pic and she really likes it and will mail it off to her to check fit and hope the alterations are minimal, we are close in size and think if anything I will have to shorten the sleeves, which would be an easy fix. I am so behind on sewing projects.. so off to begin sewing my mom's dress for our Las Vegas trip, until then Everyone have a Great Weekend. You are the Best. Aunt. Ever! What a cool outfit! Man, $100, whew! Say, you could go into business now. LOL! Hurrayyyy! That outfit is fabuloussss. I thought I read this wrong when you wrote wrestling outfit. That turned out great. I want a wrestling outfit!! Great wrestling outfit. You are Aunt of the Year. If you got your sewing mojo back and I still have some, maybe I didn't steal yours after all. Then whose sewing mojo do I have? Could it be ... mine? A wrestling outfit! It looks super cool, you ARE a super aunt! Well, aren't you just the favourite aunt!! Awesome job!!! That's so cool! Glad you have your sewing mojo back! I'm glad you found the thread! The outfit looks great and your niece will be pleased! WOW Sheila! I like your version better than the $100 version! I agree with Heather, you could go into business!!! Great job! Thank you All for the Awesome Compliments. Great outfit but, I won't want to meet her in a dark alley, lol. Sheila - the outfit looks great. Lucky niece! I love it! I especially love that your niece is a wrestler. The best part is she'll be better dressed than all the others. Wrestling, that beautiful outfit is for wrestling !!! Well... your neice is fortunate to have such a generous and talanted auntie. Wow! Look at you....wrestling outfit! Cool! Thanks for the generous comment on the sheep blanket, I love that pattern. Wow, you are amazing! beautiful work, your niece will love you!! Wow! What a great outfit, beautifully designed for the purpose and at a great savings. Your niece is going to want more outfits from her aunt for sure! Glad the wooly nylon thread worked out so well for you. Great job! You did the impossible, reproduce something exactly to specifications - took a lot of ingenuity. Obvious nomination for Aunt of the Year. Excellent work. OMG - The wrestling gear is super-fabulous!!! Holy moly - that outfit is awesome! I may have to ask you for advice on Mardi Gras dresses! You are amazing.